Furnace: A furnace is a device used for heating. The name derives from Latin fornax. 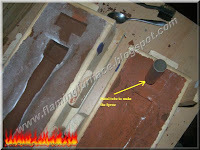 In my blog I will introduce my home made furnace for melting aluminum. In order to Heat this DIY type of furnace it could be achieved by using charcoal, propane gas, waste oil or electric heating element. Crucible: Is the container that holds all the aluminum parts to be melted. 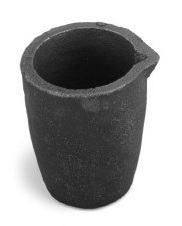 There are different types and sizes of crucibles that can be bought online some are relatively cheap. The most common one is the Graphite crucible. Another way is making your own crucible by using a 8mm thick steel pipe and to weld a 5mm metal base plate. Dross/slag: When the aluminum melts at 660°c most of the impurities such as paint will float on the top of molten aluminum and will have to be skimmed off before pouring the molten metal. Refractory: The material inside the furnace that retains the heat and has to provide a good insulation inside the furnace. The refractory could be home made and there are many sites that provide info regarding the "ingredients" and ratio of mixing. Some hardware shops sell bags of ready mix refractory. Flask: This is the container box that holds the molding sand. The box is opened from the top and the bottom and could be created in any shape and size. Most simple flasks contain two parts. Most flasks are made of alumimum, steel or wood and have different types of aligning "systems" such as pins or just timber parts aligining the cope and drag to the same position. For more commercial and multi use of your flask hinges could be added to the flask parts in order to take the flask off and use it for another molding. It is optional to add ribs inside the flask for a better sand grip. Cope: Is the top part of the flask. Drag: Is the bottom part of the flask. Parting line: Is the line where the drag and cope meet. Pouring cap/basin: This is the hole on top of the cope part made to pour the molten aluminum into the flask. Gas vent: This is so when pouring the molten metal the gas will escape from the vent. A gas vent can be easily made using a straight wire. Riser: The riser will feed more molten metal into the cavity mould when shrinking accurse. Sprue: This is under the pouring cup connected to the runner channeling the molten metal into the mould cavity. Runner: The horizental channel feeding the molten metal into the mould cavity. Mould Cavity: This is where all the molten metal sets creating a duplicate of the pattern. Pattern:Any objects placed in the casting sand creating an impression of the pattern to be created. A pattern could be made from steel, wood, plastic and other materials. Green sand is an aggregate of sand, (not green in color). Green sand is combined of very fine sand such as silica, olivine or even play sand mixed with bentonite clay and water. There are many recipes that can be found on the internet for the different types and quantities and mixing ratio. Adding to much water can lead to "porosity", casting defects as result of gas bubbles accouring while pouring the molten metal. Some metal casters use blow torches (heat-dry) over the finished moulded sand to achieve a more rigid mould. Making a good mix of green sand is a much cheaper solution then buying a ready mix. Oil Bonded Casting Sand: This type of sand could be bought as ready made. The sand is very good for high detail mouldings and is easy to work with. It's less likely to get high percentage of porosity because this type of sand is oil bonded and NOT mixed with water. The down side is it's expensive and burnt sand smoke is not the best to inhale. I personally use petrobond and am amazed everytime at how easy it is to work with and the great results after every aluminum casting. Sand Muller: Mixing big quantities of sand by hand is quit a task and for that there is a great invention called a Sand Muller. The muller is a clean way of mixing the sand without getting unwanted contaminators into the sand and saving a lot of hard labour time. The muller mixes the sand, clay and water with its crushing wheels. There are many websites of homemade designes of big and small mullers whatever suits your needs just google "sand muller". Lost Foam Casting: Another option of sand casting is to make a foam pattern with Polystyrene or styrofoam. The pattern dissolves when pouring the molten metal forming the desired object. The mould pattern can be easily carved out or cut with a hot wire Foam Cutter, the cutter could be made DIY or you can buy one. Molded foam is a cost effective solution. Burning foam fumes can be toxic always wear a respirator and work in a well ventilated area. 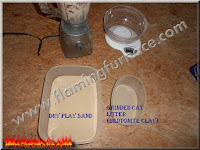 Sand casting tools: When working with casting sand the caster needs a few basic tools to achieve good casting results. Casting tools can be expensive, the hobby metal caster can use home objects or tools which are as good as professionals ones. 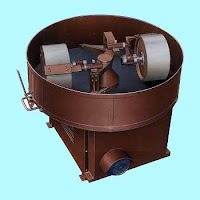 Sand Rammer: this is used to pack all the sand into the flask eliminating air pockets and lose sand that might ruin the final mould after pouring the molten metal. The rammer comes in different sizes. Most rammers are made of wood or aluminum, one side flat the other side narrow to fit into the flask corners. For bigger jobs and more commercial use the electric hand rammer is ideal. If one does not have a sand rammer a simple block of timber will do to pack the sand well into the flask. Metal wire: can be used to create the gas vent holes. Strike off bar: is used to strike all the extra sand from the flask top or bottom. I for example used L-shaped metal angle for leveling. Molder Trowel: could be replaced with a pointy block layer finishing trowel. Slick: this could be replaced with a simple small kitchen spoon to create for example the pouring basin or runner or to clear off unwanted sand particles etc'. Sand Sifter: A sifting tool is used for spreading very fine textured sand directly into contact with the pattern to get the best finishing results. Mesh size will determine how fine sand grain is sifted. I used a simple garden mesh with a deep wooden frame to prevent sand falling out of the sifting mesh. Parting Powder: is used to release cope from drag and over pattern preventing the molding sand from sticking and ruin the mould finshing. Talc powder can be used too and will be as effective. 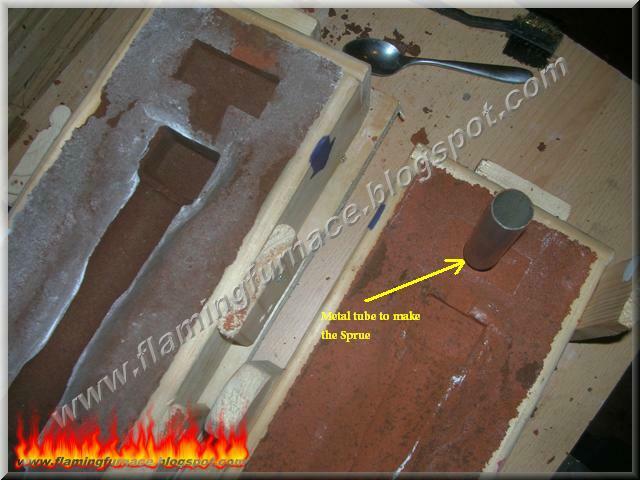 Sprue and Riser: To create the Sprue and Riser can be done simply by cutting timber to fit the work flask. For example I used a rounded timber toy to create the Sprue adding the casting sand around it. Another option and I think it is better is to use a hollow metal tube to make the sprue and riser by pushing the tube into the sand at the correct location. The metal tube should be of very small thickness which makes pushing it into the sand very easy without breaking the sand. This is optional and has two purposes. First one is to pravent spilling molten metal all over the flask top. If you are working with wood flasks this will pronlong their lives. Second the sprue and riser extension will act as a pressure head, feeding molten metal into the casting and limiting the aluminum shrinkage. (see image of the aluminum handle I made). 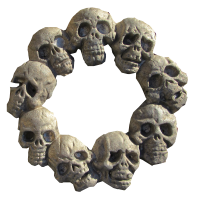 Here is an example of a perfect casting I made as a base for an object. In the image you can see all the parts as I took it out of the casting sand. 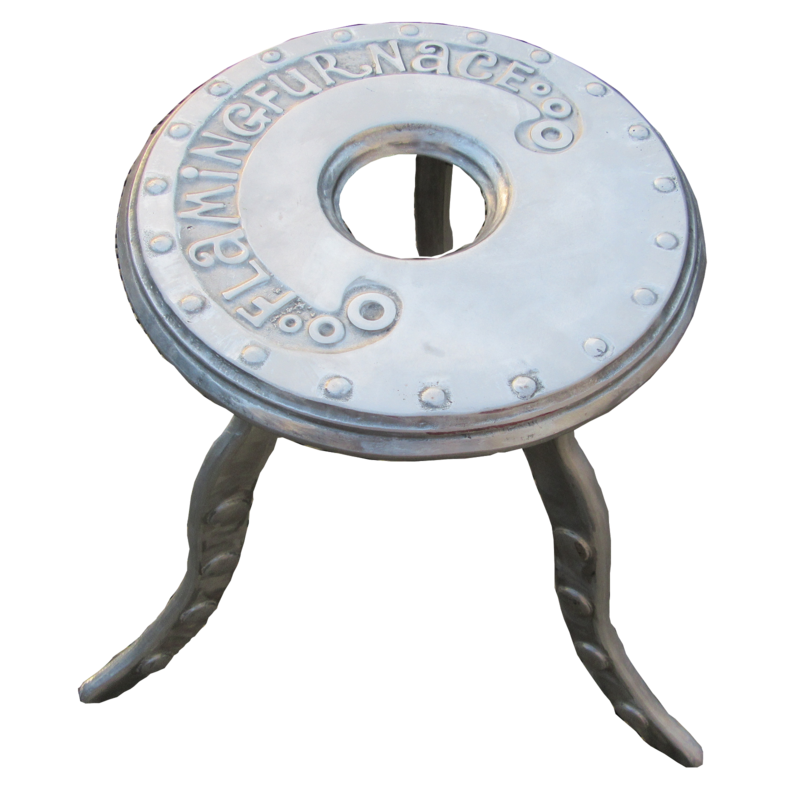 The mould was made with a sprue feeder, open riser and a molten metal well. The casting is perfect with ZERO defects. good job on the site, lots of good ideas and information for us that are learning. .. Thanks for your comment, I'm happy you liked it. I concede, I have not been on this page in quite a while... then again it was another satisfaction to see It is such a critical point and overlooked by such a large number of, even experts. experts. I thank you to help making individuals more mindful of conceivable issues.